Tonight it was dinner at Furusato Japanese Restaurant, found at the bottom of our road – on Whyte Avenue and 100 Street. Even with it being under new ownership, our waitress hasn’t changed, and so remains the outstanding service. Luckily, the quality of the food hasn’t changed either. There is no other sushi place in Edmonton that I would trust with my raw fish. It’s Furusato, or we fly out to Victoria for the real, unfrozen, deal. Because they are nice, tonight they threw in a cooked teriyaki salmon. Delicious, but we can’t help but wonder if its the left over bits from the sushi-grade stuff. Doesn’t matter. It was yummy, providing you picked through the bones. I was particularly pleased, because to me, it appeared like we were veterans of Japanese food, and did not fear half a fish at our table, with tail, bones and other bits hanging about. I felt smug and Japanese (the fact that I have to sip sake whilst swallowing the seaweed in my miso soup should have no bearing on my self-proclaimed Japanese status). Michael, who is normally very skilled with his chopsticks, was challenged with the sashimi tonight. 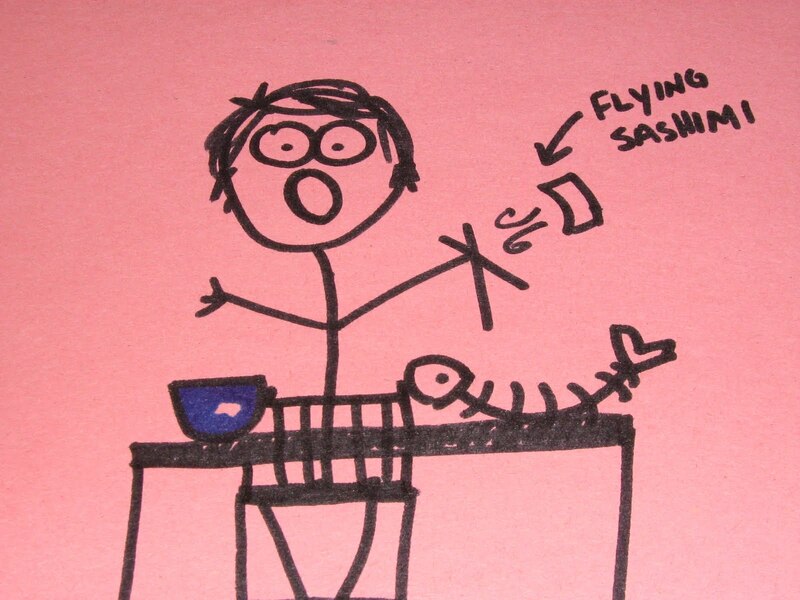 As the fish jumped about on his plate, flopped on the table, and escaped his chopsticks at the last possible moment before entering its destination, he came up with the name of a new sushi place: The Fantastic Flopping F*cking Flying Fish. Despite his frustration, the sashimi was excellent, but I do have to cut it into little bitty bits to get it down my gullet. Now of course, nothing says raw fish more than The Carpenters. I was explaining to Michael the story of Glen (from work) who bought this dog-puppet that sings The Carpenters song, Close To You. It’s a beautiful song. Sung by a dog-puppet is amusing. Watching co-workers enjoy the singing dog-puppet is priceless. Especially when it’s repeated about 10 times. Makes you wonder if they really do reduce the amount of oxygen in the office. Anyway, when Michael and I imbibe, conversation always turns to music, which means we spend hours in front of computer reminiscing, then we get into iTunes, and next thing you know, I own songs like Rasputin by Boney M.
Rah, rah, Rasputeen, Lover of the Russian Queen . . . oh, the memories! And also, I was just thinking the other day, "Jeez it's been a long time since we ate at Furusato's. We used to eat there all the time when we were dating. Time to go back!" And now your blog post will help spur me on. No F*cking Flying Fish for me though! well I am very glad to have your endorsement of Furuusato for sushi…speaking of flying fish, one of my bros. put on a party for a friend who LOVES Barbados…on the menu? yer actual flying fish — they'd been in the blue Caribbean in the morning, they were on a table in TO in the evening. Yum! BTW have you ever cooked/eaten the Israeli couscous that plump up really full, bigger than tapioca? VERY yummy!